On Saturday, November 3rd, we had a fascinating time learning about MedWish International (​MedWish.org - @MedWish) with several other Cleveland Bloggers. For the past 20 years, MedWish has been collecting surplus medical supplies to send to developing countries who greatly need them. MedWish began as an idea of Dr. Lee Ponsky. Dr. Ponsky, who was an undergraduate college student at the time, was working with volunteers in Africa, and saw the great need for medical supplies. He learned that these supplies could literally mean the difference between life and death. Our visit to MedWish began with a tour of their HUGE warehouse. (MedWish began, however, as a one-man operation in a basement!) Many individuals and groups volunteer to help sort and ship the medical supplies, which are donated by hospitals and medical centers. (Of course, more volunteers are always needed! Learn more online here.) Thousands of items, from toothbrushes to surgical instruments to cribs and IV poles, which are still in excellent condition, would end up in landfills if not for the work of MedWish. MedWish does not just send miscellaneous shipments of these supplies. They work with organizations in over 97 countries to find out which items are specifically needed, and then make sure they get those items. 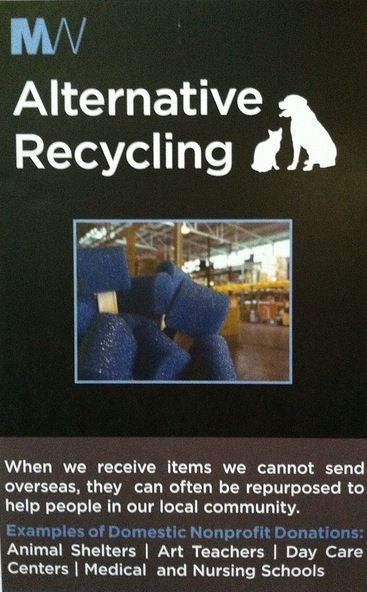 MedWish also serves yet another population: Items which are not usable by the international medical organizations are donated to animal clinics (and others) that can use them. A section of the MedWish warehouse is also set aside for their Special Needs Volunteer Program. Here is a video that shows a little about this program. After the tour, the Cleveland Bloggers worked on a project of breaking down epidural kits and sorting out the still-usable components. It felt great to know that even the results of this small project might help to save a life. If you are on Twitter, follow @MedWish and hash tag #DoGoodCLE. These photos will give you an idea of the wide variety of medical supplies distributed by MedWish. Please read Spend a Saturday with MedWish November 6, 2012 blog post to learn more about our MedWish Saturday Sort. Please read My Experience Volunteering and Touring MedWish by JULIE on NOVEMBER 5, 2012, to learn even more. We were honored to be welcomed by Dr. Lee Ponsky, the founder of Medwish. 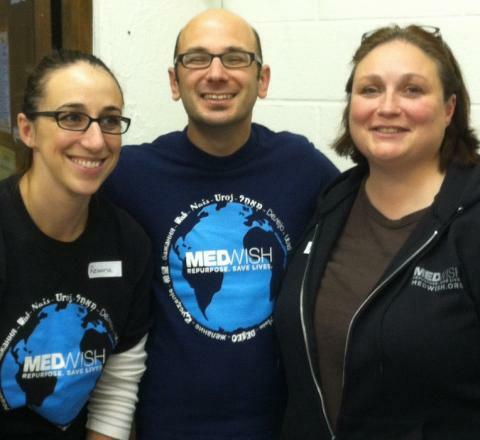 We also had a great conversation with the MedWish Executive Director Josh Kravitz. If you want to see MedWish's blog about our visit, check it out here: Cleveland Bloggers #DoGoodCLE at MedWish. I highly recommend viewing: MedWish International Videos on YouTube. #FF Saturday Sort Roll Call - @ohblogging friends: @sos_jr, @nidhizzle @whycle @adhicken @wearingmascara @sarahberridge #DoGoodCLE. RT @medwish: #FF Sat Sort Roll Call - @ohblogging friends: @sos_jr, @nidhizzle @whycle @adhicken @wearingmascara @sarahberridge #DoGoodCLE. If you want to volunteer at @medwish, email volunteer@medwish.org! This is a volunteer driven organization. I love MedWish - helping humans and mother earth at the same time - so awesome!! Your commend "helping humans and mother earth at the same time" was very well said! Yes, the way MedWish works is awesome. Thank you, Stuart - and all the bloggers who attended - for your curiosity, your volunteerism and your great work spreading the word about what MedWish does! You are very welcome. Thanks fo organizaing our tour.